PLPs rallying at Gambier House. Nassau - Opposition Leader Philip ‘Brave’ Davis recently warned the FNM government to cease from being reactionary in their dealings with the European Union crises, advising them that failure to be honest and transparent will result in country being ‘black-listed’ again. Davis said it is in the best interest of The Bahamas for the government to learn how to be truthful and open in their handling of this situation. Speaking at the ‘No Lie Lasts Forever’ rally last Wednesday, he disclosed that he is aware how the Prime Minister has lost confidence in his Minister of Finance Peter Turnquest, Financial Services and International Trade Minister Brent Symonette and Foreign Affairs Minister Darren Hendfield. Moreover, Davis reminded those present that it was Turnquest and Symonette who were together last year at the EU meeting while The Bahamas was being placed on the black list. 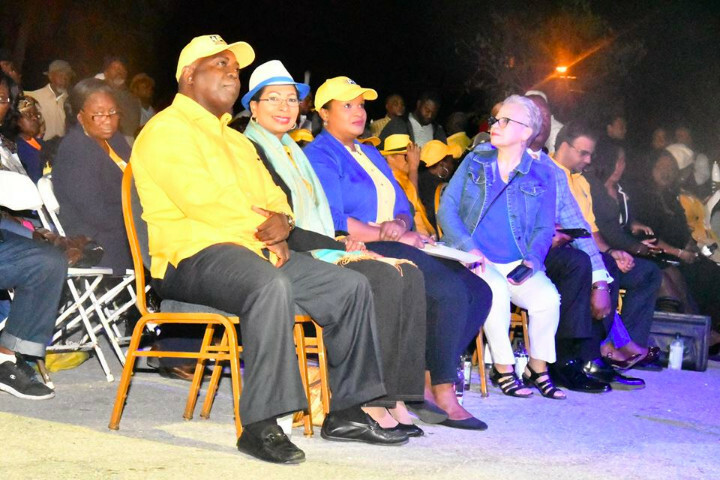 Additionally, the PLP Leader said that with the Prime Minister going to deal with the EU, the government has now exhausted all of its ammunition. This way of governing, he pointed out, continues to play into the public narrative that the government has no vision and no plan for the country. The Opposition Leader will again address supporters this coming Wednesday, Jan. 23rd at a joint meeting at the Doris Johnson High School at 7pm.